Let me begin by saying that I have incredible daughters. Really. No other way to say it. (I also have incredible sons, but they aren’t part of this story.) So when I had an issue with my kitchen soap dispenser, it makes sense that my girls would come to the rescue. But let me take you to the beginning of this enticing little drama. 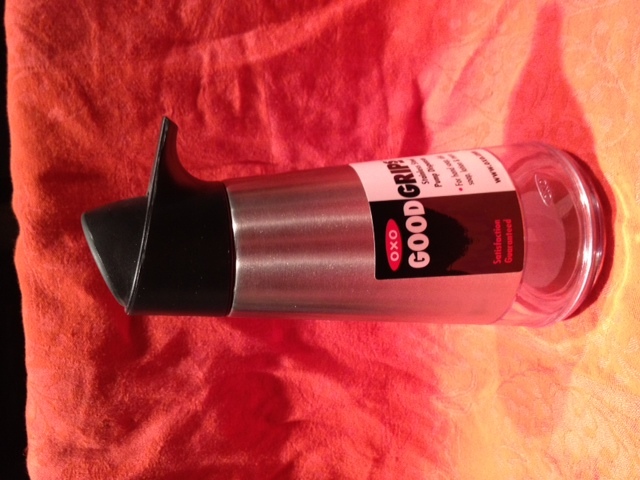 Last year I found an OXO soap dispenser that I thought was brilliant. The beautiful design in brushed chrome and black plastic has a clear plastic portion on the bottom inch of the dispenser. As my dish detergent is orange-colored, it gave a nice hit of color by the sink, and it was easy to see when the detergent level was getting low. After only a couple of months, the dispenser was accidentally knocked into the sink and the lid broke. I was distraught. Then I went out and bought an identical replacement. Problem solved. Early in December, my replacement dispenser met with a tragic end. I’m not sure how, but I went to pump soap into the sink and discovered the lid was broken. I was so annoyed. OXO makes some fabulously designed items, but no matter how great it looks, it has to function without breaking so easily. This was not acceptable and it left me with a dilemma. I needed a replacement, but only a fool would buy another one of the same obviously faulty dispenser, right? 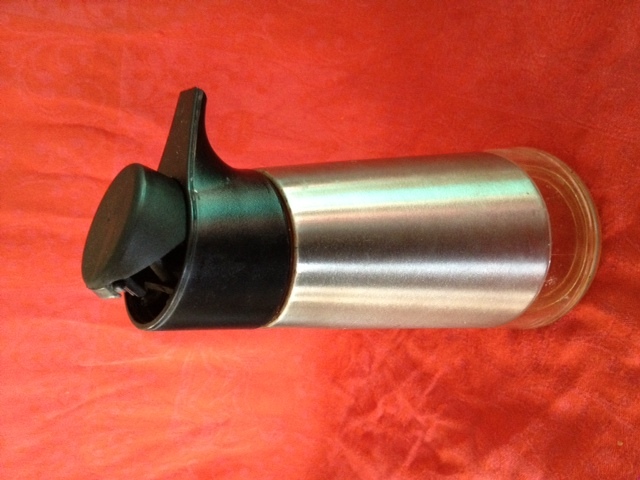 While I debated what to do, I patiently set the broken lid back in place – several times a day. What an idiot I can be! Perhaps I should mention why this is so amazingly special to me. I have collected Absolut Vodka ads for many years, and for the past few years I’ve augmented the collection with special Absolut bottles. I don’t drink the vodka, but I love the clever advertisements, and the shape of the bottle is such a classic. What’s not to love? This is the 375 ml. size bottle, if anyone thought I had a gigantic soap dispenser. Not so – this one is just right. Thanks for that comment. I’m new to Susie’s party and just getting the hang of it. I can’t believe you do 4 blogs – it’s all I can do to look after 1. I’ve always wanted to visit Finland, so perhaps I’ll get a peek on your blog! I love this and your solution! That is really thinking outside the box MacGiver style! My girls are both so clever and funny. I like to think they got the funny from me! They will appreciate the MacGiver comment. Thanks. I have the opposite solution to a similar problem. I empty all my soap dispensers and refill them with, let’s see, vodka in the master bath, bourbon at the kitchen sink, and wine- usually a nice merlot- in the guest bath. Just in case I get thirsty! Yes, but don’t you still hate it if a favorite dispenser breaks? Cheers! 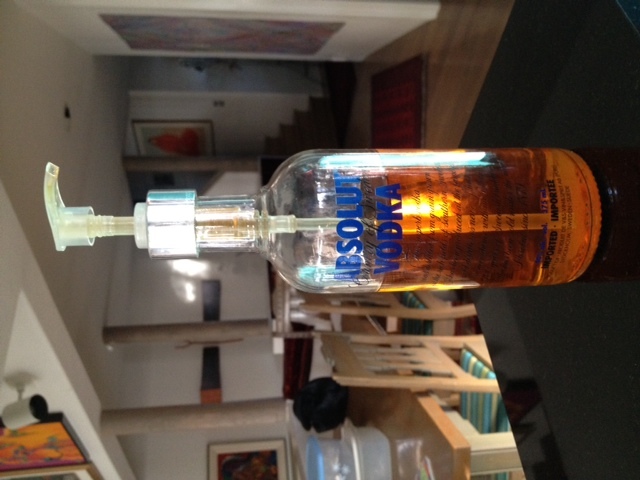 Recently added an Absolut oil bottle to my kitchen collection! Brilliant and made with love. I seem to have the same problemas you with my olive oil bottles – always breaking them! Brilliant! Absolute soap, dispensed absolutely. I didn’t know that the pump tops had such a variety of sizes. I drink Bourbon and buy it in the 1.75 size. Soap for a lifetime! I think a Bourbon dispenser would be perfect in your house. And you could even put soap in it!